If you are a central government pensioner who has been facing issues related to your pension and your grievances are not being resolved by the bank or government department despite your repeated complaints, then you can lodge your complaint on the www.pensionersportal.gov.in. This portal helps pensioners to raise their grievances with senior people in the concerned department in case they have received unsatisfactory responses so far or if they do not know who to approach regarding their pension related issues. To file a complaint on the portal, you must keep your Pension Payment Order (PPO) number handy to ensure that your complaint is quickly answered by the government. Follow the steps below to lodge your pension grievance. 2. Choose the option ‘Individual pensioners’ and click on it to lodge a complaint. 3. A new tab will open in your browser. On this portal, you can lodge your complaint, send a reminder if your complaint is not resolved within a stipulated time and view your grievance status. 4. To lodge your complaint, click on the option ‘Lodge your grievance’. 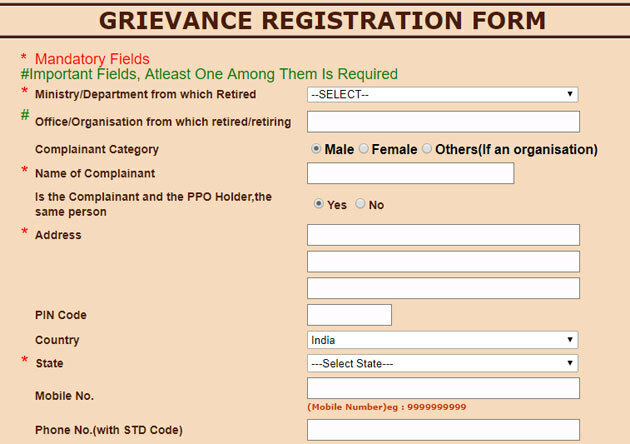 A new screen will appear showing you the ‘Grievance Registration Form’. 5 In the form, there are some fields marked with asterisk (*) and hashtag (#). Fields marked with asterisk have to be filed mandatorily, whereas fields marked with a hashtag are important to be filed in order to ensure that your complaint gets resolved quickly. 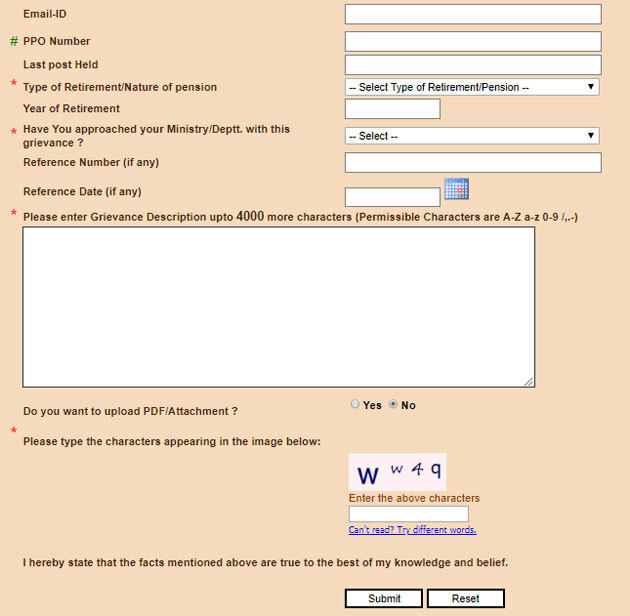 The form asks you details about the ministry or the department from which your pension and grievance is concerned to. In case your department’s name is not given in the list, the portal provides you the option of ‘Not Known/Not Listed’. If the pensioner is unable to file her complaint, then he can get someone else to file the complaint on his behalf. The form also allows you to provide the description of your grievance. While providing the description, ensure that you use permissible characters as mentioned in the form. If you have received any communication from the concerned ministry/department, the form provides you an option to upload that document. Do make sure that you upload a PDF and the size of the attachment does not exceed 1MB. 6. Once you have mentioned all the details correctly in the form, enter the captcha code and click on submit. Once you have successfully registered your complaint, then your complaint number will be displayed on computer screen. Keep this number handy for future reference. If you have mentioned your mobile number and email ID while filling the form, then your complaint registration number will be intimated to you via SMS and email as well. It is advisable to mention your contact details apart from address in case the concerned department wants to contact you for further clarification on the information required by you before sending the official response. You will get an intimation via SMS once your complaint is resolved by the department. There is a no mention on the portal about the maximum time period by which your complaint will be resolved. However, if your complaint is unresolved for more than 60 days, then you have the option to send a reminder to the concerned ministry/department. Once you have filed your complaint, you also have the option to view its status. The status will show you the details of the department looking into your complaint, officer name, designation, and his/her contact details. The portal also allows you to seek further clarification of the response received by you from the department. The portal allows you to file complaints again if the response you got is not satisfactory.